Granted the holiday parties are over, but a whole new season of parties are just beginning. Thanks to modern technology, fantastic lump crab is just a crack away. I could dedicate many posts to the wonderful uses for crab, but to keep this one realistic, how about I keep this to three great appetizers that can be served anytime of year for any event (Superbowl is coming soon)! Lets start with the TYPE of crab to use. If you have a ton of time, live near a great source of fresh crab, the right tools, and the patience – by all means steam/cook your fresh crab, crack those legs and body and harness the wonderful meat. Yes – this is the freshest you will get and most delicious. But I think it will be time for a trip to the emergency room before you can harness enough meat to make any of the below. Jumbo Lump Crab – Whole crab meat from the body area with NO cartilage or shell (premium) – this is what you want for your cakes, crab rolls, or fresh salads. This is the most expensive use it when show and freshness is important. 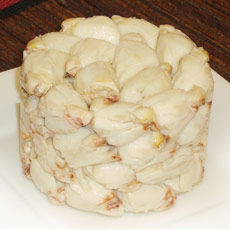 Back-Fin Lump Crab – Contains large pieces of lump and some broken body meat (good for baked dishes) – be careful to sift through to remove any shell or cartilage pieces that may have jumped in. This is next in cost and can be used in cakes mixed with the jumbo lump, beignets or on its own. Claw – Darker and sweeter than the lump meat good for soups or to mix with jumbo lump to increase the number of cakes you can make. Cocktail Claw – is the tip of the claw with some shell for easier handling (pincher part) and used like shrimp cocktail. I DO NOT RECOMMEND imitation crab or the crab found next to the canned tunafish. However, everyone has a budget so use what you can afford. You CAN use a combination of any of the above to help stretch your budget. The flavors you add will enhance the final dish. Pick one to suite your budget and quantity of guests. If you are only cooking for a couple of people – go for the gold (Jumbo Lump) if feeding a ton a people – go for a combination and make small serving sizes. Sauces are at the end. I don’t claim to challenge anyone’s crab cake recipe, but these are good. Step 1: Sauté: heat your olive oil over med-high heat. Add onions and peppers (bell and jalapeno). cook for about 1 minute, add the garlic. Remove from heat and let cool. Step 2: Mix the mayo: In a large mixing bowl – add the mayo, old bay, paprika, mustard powder, Dijon mustard, lemon/lime, Worcestershire sauce. Mix and taste. Adjust with salt and pepper. Step 3: Add Crab, pepper mixture to mayo mix. Toss. Then form into patties. Let set for about 10 minutes. heat (not too high or they will burn). These are soo good… fresh out of the oven, or at room temp. They are a great buffet item that can sit for a while and not go bad. Step 1: Heat olive oil on pan over med-high heat. Add onions, diced mushroom stems, and bell peppers. Sautee for a minute, add garlic and bacon. Saute for an additional minute. remove from heat to cool. Step 2: Mix the mayo, old bay, pepper, (any optional ingredients) and parsley together. Add in the cooled ingredients from step 1. Toss together. Add in the parmesan cheese and bread crumbs and mix again. taste. Adjust seasoning. Step 3: Stuff those mushrooms and place on a baking sheet. top with a mixture of bread crumbs and parm cheese. Step 4: Bake about 25 – 35 minutes until the tops are golden brown. Remove and eat. You can par-cook for about 20 minutes, remove, cool refrigerate/freeze and when ready reheat at about 350 until heated through. It’s like a nice fluffy hush-puppie with amazing flavor! Step 1: Heat the oil in a skillet over medium-high heat. Add the onions. Season with salt, pepper, Old Bay, paprika and cayenne and cook, stirring, until the onions are soft, 2 to 3 minutes. Add the sliced artichokes and the garlic. Cook for 1 – 2 minutes. Step 3: Whisk the eggs, milk, and baking powder in a mixing bowl until well blended. Add the flour, a little at a time, beating and incorporating until all the flour is used and the batter is smooth. Season with salt, cayenne, Worcestershire sauce and hot sauce. Mix well. Stir in the parsley. Add the artichoke and crab mixture to the batter and mix with a wooden spoon just to incorporate – do not over mix or the dough will not rise. Step 4: Heat the oil to 360 degrees. take a table-spoon of batter at a time (and in batches), and place/drop into the hot oil. When the beignets pop to the surface, roll them around with a slotted spoon in the oil to brown them evenly. Remove and drain on paper towels. Combine the first 10 ingredients in a food processor with a metal blade and process until smooth. Season with salt, cayenne and pepper. While the machine is running, slowly add the oil, a little at a time, until thick. Taste and adjust seasoning if necessary. There are plenty of other sauce that you can use, but these two are quick easy and compliment the recipes above. Have fun and enjoy the Crab. Posted by culinaryease on January 9, 2011 in General Cooking, Parties, Appetizers, and More, Recipes, Vegan/Vegetarian and tagged Crab, Crab cake, Crabmeat.